WilkinsonEyre, one of the world's leading architecture practices, BuroHappold Engineering and award-winning architectural practice Urban Agency have teamed to create the new Copenhagen inner harbour bridge. The design will link the two misaligned axes of Vester Voldgade and Langebrogade in a graceful curvature. This process will be able to reconnect the city to the walls of Christianshavn, allowing for better use of the space. The bridge will gradually raise leading into the middle, before sloping down again to reach the alternate side, making it easy to use for pedestrians and cyclists. Two opening spans at the centre of the bridge will be able to pivot and open, creating a 35m wide shipping channel. The bridge's sleek and elegant appearance also suggests it will provide a cushion for the firm stiff lines of the neighbouring Langebro Bridge. The shortlist contained five teams of interdisciplinary roles with a final winning proposal chosen. BuroHappold is the project lead and engineer, with WilkinsonEyre and Urban Agency covering the architectural design. NIRAS A/S, Eadon Consulting and Speirs + Major provide added support. 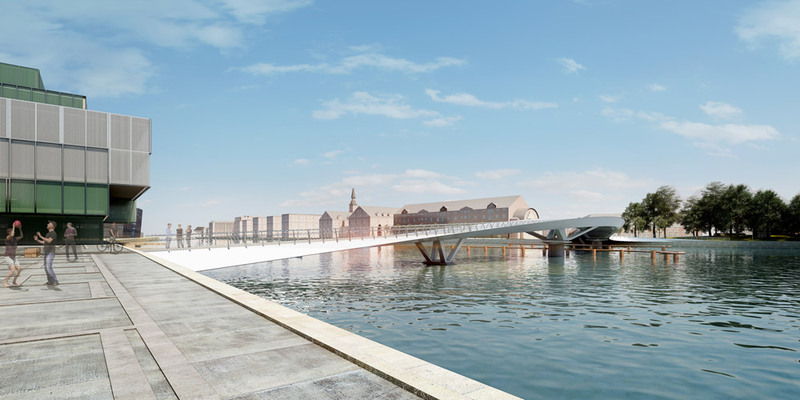 The city of Copenhagen and Realdania will be implenting the bridge and the client, Realdania, is giving the bridge as a gift to the city in supporting the development and accessibility of the harbour.